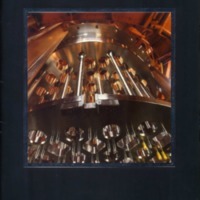 A brochure featuring Westinghouse Electric Corporation's Nuclear Components Division manufacturing facility in Pensacola, Florida. After the downturn in the business, became the sole Westinghouse factory dedicated to both large and small nuclear components when the Tampa plant was closed in 1981. This "Manufacturing Capabilities" insert was produced in 1988. The market for new nuclear power plants had dropped sharply and the Pensacola plant was being used mainly for nuclear service work. Westinghouse was actively seeking contracts from outside businesses, such as the U.S. Department of Defense (DOD), that could utilize the sophisticated manufacturing capabilities of the plant. At the same time, the 100-year old Westinghouse factories in Pennsylvania were being closed and the newly-formed, Orlando-based Power Generation Business Unit (PGBU), under General Manager and Vice President Frank R. Bakos decided to make use of the Pensacola plant as part of its "Great North American Factory." Many 100+MW-class W501D5/D5A and 150+MW-class 501F gas turbines were assembled there and shipped either by rail or barge from the plant. At the height of the U.S. nuclear power business during the 1970s, Westinghouse invested heavily in manufacturing facilities in Florida that were built to enable the company to achieve a leadership position in the industry. A plant was built in Jacksonville for the Offshore Nuclear Power Plant business), and others were established in Tampa and Pensacola, both to supply specialty components for nuclear power plants. Ultimately, the plant was shut down, due to nuclear component work being transferred elsewhere and the decision to consolidate gas turbine and generator manufacturing at other plants. Following the Siemens acquisition of Westinghouse Power Generation in 1998, the property was sold and is now being used by General Electric Company to do manufacturing and service work on large electric generators. Original 24-page brochure and 16-page insert, 1988: Private Collection of Harry L. Jaeger. Digital reproduction of original 24-page brochure and 16-page insert, 1988. 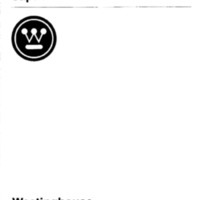 “Westinghouse Nuclear Components Division and Manufacturing Capabilities.” RICHES of Central Florida accessed April 21, 2019, https://richesmi.cah.ucf.edu/omeka/items/show/7460.